No trip to Munich is complete without visiting the Hofbräuhaus. 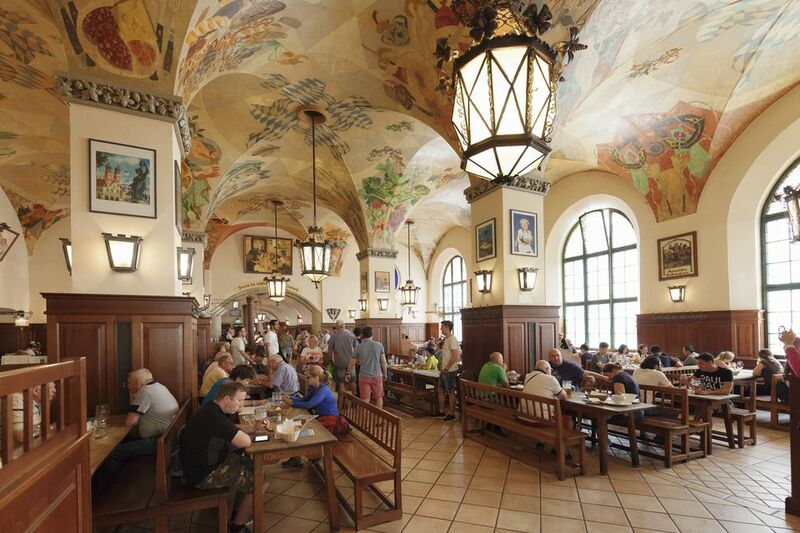 The most famous beer hall in the world and largest in Munich, it can holds up to 5,000 revelers. While its permanent location is in the heart of Munich's old town in Marienplatz, it also hosts the second-largest beer tent at Oktoberfest. Whether you visit during the festival or any time of the year, plan a trip to Munich's Hofbräuhaus to experience the culture of Bavaria. The Hofbräuhaus is also the oldest beer hall in Munich, established in 1589 by the Duke of Bavaria as the official Royal Brewery. Soon after, it became publicly owned and operated by the Bavarian Government and has remained so ever since. The brewery slowly transformed throughout the 19th century to be so much more. The massive hall grew to include a restaurant and entertainment center to hold meetings, weddings, concerts, and plays. It has been patronized by legendary figures such as Mozart, Lenin, Marcel Duchamp, Louis Armstrong, Mikhail Gorbachev, and past American Presidents John F. Kennedy and George H. W. Bush. The composer credited visits to the Hofbräuhaus with his creation of the opera Idomeneo. An infamous visitor to the Hofbräuhaus was Adolf Hitler. He held the first meeting of National Socialists here in February 1920 in the Festsaal. This is actually where Hitler declared the 25 thesis that paved the way toward WWII and the Holocaust. During the WWII bombings, much of the Hofbräuhaus was destroyed. It wasn't re-opened until 1958 but word of the famed Hofbräuhaus had spread, partly due to impressed American soldiers who told stories about the impressive beer hall and touted heavy beer mugs with the iconic "HB" logo. There are now over 25 Hofbräuhaus locations in the world from Seoul to Stockholm to St.
Petersburg, Florida. But nothing beats the original. It is a top attraction in Munich. The traditional beer hall environment in the Schwemme consists of an animated atmosphere, hearty food, live music, and massive beers. Strangers and friends crowd together on the long wooden table to have a party any day of the week, any day of the year. Admire the rustic seating, some of which is has been in this very hall for 100 years. The Hofbräuhaus is also refined with timeless elements like the artful paintings of fruits and vegetables that stretch across the ceiling lit by iron chandeliers the size of street lanterns. Bavarian oompah bands play every day. Listen for the famed Hofbräuhaus song, "In München steht ein Hofbräuhaus, oans, zwoa, g'suffa!" ("There's a Hofbräuhaus in Munich—one, two, down the hatch!" in the local dialect). The Braustüberl restaurant on the first floor of the Hofbräuhaus is the slightly more sedate restaurant portion. This is ideal if you want to be able to speak to the rest of your party, for families, or for a beer hall "light" experience. The Hofbräuhaus's biergarten is a shining example of what to expect at this most German of institutions. This idyllic setting for 400 people amidst towering kastanienbäumen (chestnut trees) in the middle of the city is perfect for brilliant summer days. This is the place to eat traditional Bavarian food. Almost everything served is proudly sourced from the region with an in-house butcher and brewery ensuring top quality food and drink. Start with the Bavarian meal of champions of weisswurst (white sausage), senf (mustard), brezn (soft pretzel) and weissbier. That is right - beer for breakfast in Bavaria. Or you can save your giant pretzel for a light "snack" with obatzda cheese. Eat a filling lunch of schweinshaxe (roasted pork knuckle), knödel (dumplings), and sauerkraut (no translation needed). Vegetarians and vegans have a harder time, but can still find delicious things to eat with spätzle and flammkuchen. Peruse the whole menu to get your mouth watering. There is no reason you ever have to leave the Hofbräuhau. Hofbräuhaus got its start as a brewery and it hasn't strayed too far from its roots. Its beer was so famous that King Gustavius from Sweden agreed not to not invade the city in exchange of 600,000 barrels during the Thirty Years War. Like many German breweries, it still adheres to the reinheitsgebot (500 year old beer purity law). Beers are served in giant 1-liter glass steins known as a mass. Beers range from the Hofbräu original to helles, dunkles, weißbier, and maibock. For those heathens that don't want beer, there is also soda, juice, wine, and spirits. While the Hofbräuhaushas been accused of being a tourist trap for its many, many international visitors, it is still a local hang out. Regulars have their own mugs as well as regular seat reservations known as stammtisch. Many of these Müncheners have been coming to the Hofbräuhaus for their whole lives. The oldest regulars` table has already been held for 70 years. While it would take more than one visit to reach these regulars status, you might still want to make a reservation to avoid missing out on the legendary atmosphere - especially on weekends and during Oktoberfest. They are open every day of the year from 9 am to midnight and reservations can be made in the Braustüberl (not schwemme or biergarten) by simply reserve a space via their online form or call 49 89 / 290 136 100. Also note that reservations cannot be made here for the Oktoberfest tent.